Gadget lovers are spoilt for choice when it comes to portable media players, with an increasing number offering web access through wi-fi connections. Portable players should be just that - easy to carry, lightweight, with a well designed user interface (UI). The two most aesthetically pleasing devices are the iPod touch and the Nokia N800. Apple's device deserves special mention - at only 8mm thick and impossibly light, it looks like a vision of the future. The other devices have put function before form, which is not necessarily a bad thing. The re-designed PSP has a low-cost plastic feel but it is much, much lighter than the original machine and can now sit comfortably in a jacket pocket. The Archos 605wifi is the bulkiest of the machines - in part because it has much more functionality than the other devices and is the only one to come with a hard drive built in. In terms of UI the iPod touch is the standout device - its touch screen interface is a revelation and rewrites the rules for mobile devices. Whether its skimming through hundreds of songs, cover art for albums, contact information or video files, it is a delight to use. Nokia's gadget suffers the sins of many of its mobile phones - confusing menus and a sluggish response make it irritable to use. The PSP's interface is very clean but quickly becomes unwieldy if more than a handful of songs or video files are stored on it. The Archos interface is also a little cluttered and is not helped by a poor colour scheme that makes every icon and button look identical. The buttons on the device are not exactly intuitive either. 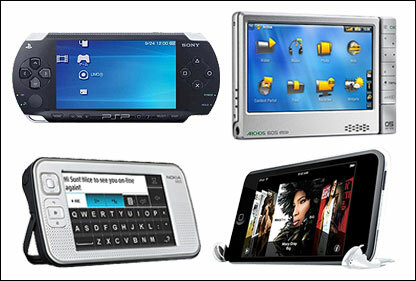 If one were to look at the raw specifications for all four of the devices it would show that the Archos comes out on top, followed by the N800, the iPod touch and the PSP. The Archos has the highest resolution and the best DPI (dots per inch) and the front end of the system looks very sharp. But the brightest of all the screens is the iPod, which looks vibrant, with the various menu buttons almost bursting off the screen. When it comes to video playback the quality depends on a number of factors - the quality of the original source file and the codec, or format, that it has been saved in. The format of choice for many digital video aficionados is h.264, which is supported by all of the devices apart from the Nokia N800. However, Archos require users to pay for a plug-in to unlock playback in that format, while the PSP's support for h.264 only seems to work with Sony's own files. To compare video playback I encoded the same piece of video four different times - taking advantage of the best playback options, the maximum bit rate and screen resolution for each device. I tried to convert files to h.264 for the PSP but with little success and so had little choice but to judge it on straight MP4 playback. The results were clear - the Archos and iPod touch offered the best video playback fidelity, while the PSP and N800 were a distant joint second. If I had to choose one device as the winner for video playback I would plump for the iPod as its contrast and brightness seemed better than on the Archos. But the Archos is the clear winner when it comes to supporting different video formats - there is very little it does not play. The iPod touch and PSP are much more limited when it comes to support for file formats such as DivX, a popular codec for video enthusiasts. The Archos also has the ability to record video direct from your TV or video player as a very personal video recorder. There are software packages which can migrate video recorded onto a PC/Mac on to the PSP, iPod and N800 but none of their solutions are as simple as recording directly to the Archos device itself. Sony is introducing a feature for the PSP that will allow it to playback files stored on a PlayStation 3 over wi-fi. So any video files on the main console can be accessed via the handheld device. As the only 'dedicated' music player the iPod should win hands down. And it does. Audio quality on each device is hard to distinguish - unless you are an audiophile. But the iPod's integration with iTunes makes it the easiest device to synch/transfer tracks and its astonishing user interface makes choosing tracks as simple as flicking between album covers on screen. Sadly, the iPod touch does not come with external volume controls nor support for a wired remote which is an oversight at best and a magnet to thieves - as you take out the device to change track - at worst. Web access on the go in a conveniently-sized device is now a reality. The high quality screen on all four devices makes web browsing far more enjoyable than on a mobile phone. In fact, it can often equal browsing on a desktop or laptop. The PSP has the most basic browser, and some large web pages fail to load. The browser also has to connect manually to a wi-fi hot spot making it slow to use. Loading different web pages can also be painfully slow on the device and so often it is easier to load a website designed specifically for a mobile rather than full-sized pages. The N800 is touted as an internet tablet and loads full websites quickly. It auto connects to friendly wi-fi access points and supposedly can access the net by connecting to a separate mobile phone via Bluetooth. However, I was unable to get this feature to work with a number of different phones and mobile networks. Frustratingly, Archos requires users to buy the browser as an add-on rather than supplying it out of the box. It is a strange decision but once downloaded the browser is reliable. Apple has received a lot of press for its use of the touch screen in web browsing. Pages load very quickly indeed and users double tap on an area of a screen to zoom and the page can be moved around with just a finger. It forces a different way of looking at and reading web pages but once mastered it makes browsing very pleasurable. The iPod can also switch between favoured wi-fi access points automatically. However, the iPod touch is the only web-enabled device we tested that does not support Flash. So while the other three gadgets have access to thousands of video clips, complex web pages, games and music through Flash, the iPod touch is hampered without it. The PSP Slim has the most obvious non-video feature - it is a games console. The device has hundreds of titles available and PlayStation 3 owners can download games for the handheld also. The N800 is an open platform - which means many third-party developers have built applications, such as instant messaging, internet telephony, productivity and blog editors. The Archos 650wifi comes in four different storage flavours - with up to 160GB of storage. The iPod touch has 8GB and 16GB of space, while the Nokia N800 takes mini-SD cards and the PSP takes Memory stick cards. Each of the four different devices has strengths and weaknesses. For the quality of video playback, innovative interface and simplicity of design the iPod touch stands out. But it can playback only a limited number of video formats and only Apple is able to design new applications for the device. The PSP Slim is essentially a games console and so if play is your priority and you want audio/video playback as an extra, then the gadget is a good option. The N800 has support from a wealth of third parties and looks to be more of a hobbyist device. The Archos 605wifi is the all-rounder, offering huge storage, flexible video playback and the ability to record TV direct to the hard drive.